Yep, the folks here try to remain upbeat in spite of the seriousness of this disease. And you know what???? There are MANY Stage 4 members who are out there living life. There are so many new tx appearing almost every day, so if one isn't working ~ there is another one to take its place. I'm a little more tired than I used to be too...but then I am a little bit older as well. . Perhaps you could add a profile under your name like you see we all have. That will help our members 'help' you better since everyone will see, at a glance, what stage, tx, etc. I am so glad you decided to post. He's been through a lot already, but it sounds like your husband is doing well with his treatment. That's great and shows what a fighter he is. Keep us posted on how the 2 of you are doing. Welcome, you will get a lot of support here. It sounds like you husband is getting some aggressive treatment. If he is getting radiation every day and working too, I guess he should be tired. Pray for a good report on the 29th. I have been recommending to members to have the cancer survivor log on to the site also. I think your husband would get a lot of encouragement by posting himself as well as you. Keep us posted and do a profile. Welcome aboard. For what its worth, I had Cisplatin and my tumors responded shrinking about 40%. Good for him going to work. Sounds like a fighter. If this first scan isn't what you were hoping for, just be patient. Welcome Karla. I am so sorry you needed to find us, but am so glad you did. There is hope, and it is important to stay on the right side of that hope! God bless you, and best wishes. Hope your husband's scan shows good results. Radiation can cause a lot of fatique - but it sounds as if he 's doing well. Hi Karla, welcome. I did not have stage IV (that I know of) but I was an upper stage. My treatment started the same as your husband. After, a CT said, all had shrunk and they planned surgery. After surgery I asked about the tumor and they said it was dead, all scar tissue! I hope the Cisplatin, VP 16 and daily radiation do the same for your husband most especially as he was diagnosed on my birthday! Can you say what made his diagnosis Stage IV? Did he have distant metastasis? If so, are they doing anything else for it? Keep us posted. Thanks to everyone for your replies and words of encouragement. Donna, they said late stage IIIB or early stage IV. The primary tumor was in the right lung, the lymph nodes in the middle of the chest were cancerous and he also had nodules on each side of his neck - two on the same side as the tumor and one on the other. They said the one on the other side of the neck is what staged it at IV. Welcome to you and your husband. Great attitude, aggressive treatment, good overall health (otherwise he probably wouldn't be working full time) -- you guys have plusses all over the place and are going to be another one of our success stories, I'll betcha! Thanks for the profile, which came in as I was starting to write this. It will help you, not just the rest of the group, since you won't need to give background every time you post a new message. Also, you can update the profile any time there's new information, even if you don't feel the need to post a new message, and the update will appear with all your existing messages that have a profile attached. First of all welcome! You'll definitely find many many friends here with lots of advice and experience. My husband had the came chemo as your husband and I can tell you that the cumulative effects of the chemo and the radiation on top of it, is going to make him very, very tired. Hi Karla, I'm new here as well, but I couldn't agree more. This site has the most positive members and it has already been a great help to me. Good luck in your husband's test results. I concur that he sounds like a real fighter. 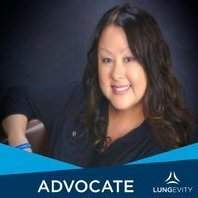 Sorry to hear your husband has lung cancer stage iv, but do remember, lung cancer is no longer a death sentence. There are, as you have already discovered, many treatments that were not available even a few years ago. It sounds like your husband has a pretty aggressive treatment plan going on, and do hope that the scan results are good. There are many people on this site and others not on any site who have lung cancer stage iv and they are fighting the beast with treatments also. It is amazing that your husband can still work with all that's going on with his treatment. Most people find it very tiring to go through the treatments, so he must have a strong constitution, and that's very encouraging. Sending prayers and best wishes for a good scan and improvement. Welcome to the board. I also have kept working full time through most of my treatments so far. It's not easy but I find it helps me lead a normal life and as long as I'm working maybe I can beat this thing. But regardless, he will feel very tired and should rest when he can. The fact that you are on this site looking for information means you are already a great support to helping him fight. My husband is not undergoing radiation, but is in the middle of chemo. He has worked full time through most of it (there have been a few short days.) We are trying to live as close to normally as possible. Lilly, those are lovely children in your photo! You received many replies here and I hope it made you feel better. His doctors seem to know what they are doing. Good luck on the test on the 29th. I just wonder why it is taking so long to get the results. Maybe you can call before that time and see if they have them. But maybe you want to wait. That is up to you. I will be thinking of you and him and sending prayers for good results. Thank you for coming out of the shadows and joining our family. You know we are always here for you. Glad you found us but sorry there is a need. I'm sorry for your husbands diagnosis- but you're right there IS hope- and you will find it here. We've many survivors with alot of experiences and support to share. Please know that we are here for you and your husband. Keep posting!! Keeping you both in my thoughts and I hope a happy and peaceful holiday for your family. I am sorry you had need to seek out a site such as this but glad you found this one. Please let us know what we can do to help you and your husband along this journey. I was so happy to find this site too -- for the same reasons you say. People are hopeful, positive, and living proof that miracles exist! Sorry about your husbands DX! Take care of yourself and I know your going to find alot of useful info here.. Welcome to the site. I am new to this site also. My husband was diagnosed on October 2nd and is stage IV also - some similarities to your husbands but on different chemo treatment. I will be really interested to see how your ct scan results turn out. Please keep us posted. My husband is on a different chemo program and can't get radiation unless he stops the chemo for a few weeks. Which isn't good either...ughhhh!!!!!!! Just be as positive as possible. Good luck!